The CVRR Trail is a biking, jogging, and walking trail that traverses 7.0 miles from the Shawmut Mill Village. The trail lies directly on top of what was once the Chattahoochee Valley Railroad that serviced the four textile mills of the area. The railroad carried passengers, cotton, cloth, and supplies between the Shawmut, Langdale, Fairfax and Riverdale mills. Today, this trail ties together all the mill villages that compose the City of Valley and passes the majority of 18 historic landmarks in the area. The Northern Section of the trail is 1.4 miles long and the Southern Section of the trail is 5.6 miles long with a .5 length of roadway and sidewalk connecting the two trails. Location: Paved rail-trail within the city limits of Valley in east Alabama. From Montgomery, AL: Take I-85N to exit 77 right onto FOB James Drive to 3rd red light-road ends-merge right onto Hwy 29/20th Ave; immediately get in left turn lane turn first left onto 59th street @ Langdale mill parking lot. The Chattahoochee Valley Railway was constructed by the West Point Manufacturing Company to serve several cotton mills that it operated along the west bank of the Chattahoochee River. Operations began on the standard gauge line in January of 1897. The first section to open was a 10-mile link between West Point, Georgia, and the mill at Riverview, Alabama. The line was soon extended about 7 miles to Jester, AL. In 1916 the railroad was extended to Bleeker, AL, on the Central of Georgia between Opelika and Columbus, giving the line south of West Point a total length of 27 miles. In 1908 the rails were extended north from West Point to a connection with the Atlanta, Birmingham and Atlantic at Standing Rock, AL. This section was abandoned in 1932. In 1974 the tracks between Bleeker and McGinty, near Riverview, were abandoned. The entire railroad ceased operations in 1992. A collective history of four small southern mill towns lingers in the air along the Chattahoochee Valley Railroad Trail. At the eastern border of Alabama, amongst gentle hills and the mighty Chattahoochee River, are nestled Shawmut, Langdale, Fairfax and River View—all towns listed in the National Register of Historic Places. The mills that gave rise to these towns, which housed and sustained their mill workers, were built just after the Civil War. Nearly 120 years later, in 1980, the towns incorporated to become the City of Valley, now a growing community of nearly 10,000 residents. The CVRR, as is it known to some, begins in the village of Shawmut with quiet spans of straight trail running through tall pines and a few homes set back from the trail. If you ride the trail's full 7.5 miles by the time you reach the terminus in River View you will have had a taste of the local color including shops, town centers, and historical bridges and mills. You may have also decided to take a brief side trip off the trail to catch a stunning view of the wide Chattahoochee River. When the Chattahoochee Valley Railroad stopped running in 1992, Valley's mayor, Arnold Leak, then a council member, began exploring ways to reuse the railroad. "After several false starts," he says, "I became familiar with ISTEA grants. Working with the council and the public, I was able to gather enough support to acquire the rights-of-way and to apply for the grants to build the trail. To summarize … we built it!" The hope is now to have Valley become a gateway to the Chattahoochee nature trails. And the area certainly has a rich historical base upon which to build. 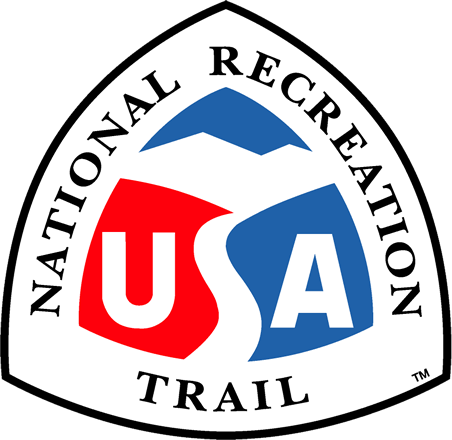 The City of Valley received a grant in 2009 from the Alabama Department of Economic and Community Affair's Recreational Trails Program that funded the addition of 10 fiberglass graphic panels located along the CVRR Trail. These signs point out historical points of interest located in close proximity to each sign, as well as information on the Chattahoochee Valley Railway. "Rusty" the Iron Man, made from scrap railroad materials. Photo by Rob Grant. Covered bridge. Photo by Rob Grant.